Last week, on October 4th, the winners of the 2011 Nobel Prize in Physics were announced. This year, the prize has been awarded to three astrophysicists who were independently responsible for probably one of the most bizarre discoveries in the field of astrophysics: the ever-expanding universe. Back in 1998, Saul Perlmutter led a team of scientists studying supernova explosions, while at the same time Adam Riess and Brian Schmidt were part of another team that was also studying these enormous explosions in the universe. After analyzing different samples of supernovae, both teams came to the same, shocking conclusion: the universe is ever expanding. As a reward for their groundbreaking work, the three astronomers have been awarded this year's Nobel Prize in physics. When studying the expansion rate of the universe, it is important to compare the current rate with that of the early universe. But to study the early universe you need something that is very bright in order for it to be seen billions of light-years away. This is why the three winners focussed on studying supernovae. These are some of the biggest explosions in the universe and they can be traced back billions of light-years away. However, how do you know how far away a supernova explosion occurred? When the explosion is very faint, does that mean that it was extremely far away, or was it just a smaller explosion? To answer this question, we should take a closer look at the supernovae the scientists were focussing at. It is important to know that there are basically two different kinds of supernovae: those that mark the end of a very massive star's life and those that are the result of a white dwarf star becoming too massive to support its own gravity. The first type of supernovae are not the ones that the three winners were interested in � it is impossible to tell the exact distance to such an explosion from just looking at it. The more massive a star, the brighter the explosion, so it is impossible to tell if the explosion was really faint or if it happened really far away. However, supernovae of the second type (the collapsing white dwarf stars or so-called �type Ia� supernovae) are always equally bright. A white dwarf is the remnant of a star with a mass similar to that of the Sun, but a size comparable to that of the Earth. If such a compact white dwarf star has another star circling around it, then the white dwarf�s gravity may at a certain point be able to tear material off the other star. Under the right circumstances the white dwarf starts to accumulate this mass, until it becomes too massive to support its own weight. This happens when the white dwarf is exactly 1.44 times the mass of the Sun. At that point, a thermonuclear explosion ignites and the white dwarf explodes as a type Ia supernova. Because the trigger for this explosion is always the same, the brightness of the explosion is the same as well. Hence, a type Ia supernova can be used as an excellent light beacon for studying distances in the universe. Type Ia supernovae cannot only be used to estimate distances but also to study the expansion rate of the universe. Due to the expansion of the universe, not only the space between the galaxies expands but also the light that travels between them. When a light wave expands, its colour becomes redder. Therefore, the redder the light of the supernova the more the space between the supernova and us has expanded. So using the distance estimate from the supernova and the redness of its light, astronomers can get an idea of how the expansion rate evolved over the lifetime of the universe. Before the three prize-winning astronomers completed their supernova research, it was known that the universe was expanding. However, it was not yet known if the expansion would last forever or that it would stop, causing the universe to eventually collapse back on itself. This latter idea was most commonly believed to be the right one. In such a scenario, the combined gravity of all mass in the cosmos would eventually stop the expansion and pull all matter back until the whole universe ended up where it was before the Big Bang. This common belief was the main reason that all three winners initially did not believe their results, which suggested that the expansion of the universe was in fact accelerating. However, the more they analyzed their data, the stronger the conclusion became. Ever since, various measurements confirmed the idea of an ever-expanding universe. There is still quite some scepticism, especially from people who believe in a beautiful, symmetric world. In their view, a universe that started with a Big Bang has to end somewhere as well. If the universe is indeed ever expanding, it will eventually be a cold dark place, where no other galaxies can be seen since they have floated too far apart. And at some point, the universe will expand faster than the speed of light � this is not in disagreement with Einstein's theory of relativity, since it is not actual matter going faster than the speed of light, but merely the space itself that is expanding. This implies that the universe will become too fast for light to be able to cross it. Besides the perhaps frightening thought of having an ever-expanding universe, astronomers also face a problem concerning the accelerating expansion�s driving energy source. There has to be a source of energy to keep the universe expanding. This is something called �dark energy�. Current research shows that this mysterious form of energy has to make up about 70 percent of our universe in order to keep the expansion going as it is. Unfortunately, it is not yet known what this energy source is made of. Astronomers are still puzzled how dark energy works and a lot of research is now focusing on getting a better understanding of dark energy. And this is where we come full circle: the physicist who discovers the composition of dark energy can instantly book a flight to Stockholm, to collect an inevitable Nobel Prize. Ever since Neil Armstrong and Buzz Aldrin set foot on the Moon in July 1969, the main question has been which object was going to be the next target. Was there any other celestial body that could be reached by humanity? Virtually everything seemed possible during the arms race between the United States and the Soviet Union that led to the Moon landing in the 1960s, as it proved that even the sky wasn�t the limit. It shows a harsh contrast with the present day, more than forty years later. While the global powers are perhaps on more peaceful terms currently than they were during the Cold War, their space programmes have lost priority due to concerns about the economy, durability and climate. And the Moon is still the farthest we have gotten. As has become common knowledge, the next target should have been Mars. The ideas for manned missions to the Moon and Mars both originate from the early 1950s, when Wernher von Braun made a first technical analysis of the possibilities. Since then, the prospect of putting astronauts on Mars has always been a steady twenty to thirty years ahead. In the 1960s, the United States envisioned a Mars landing in the 1980s, while the US, Europe and Russia all proposed independent missions in the early 2000s that would successfully reach Mars by 2020-2030. Regardless of such consistently high hopes, history teaches us that in the vast majority of cases something gets in between. The technical feasibility of a manned mission to Mars is probably the least of all hurdles, but of course, it is far from trivial to take the next step in manned space flight. It is not known how the human body responds to almost two years of low gravity and elevated levels of cosmic radiation, and there are also concerns about social isolation, particularly in the possible scenario of a one-way trip. The situation is not aided by the limit imposed by the speed of light, which delays communication between the astronauts and Earth by up to twenty minutes. If all of this isn�t enough, the reliability of space-faring vessels has not yet reached the level that might convince a nation to risk their reputation on such a bold endeavour. However, these issues are all far from insurmountable. All it would take is a joint, concentrated effort that involves multiple space organisations from across the globe. And looking back on the past century, humanity has faced bigger challenges. Let us not forget what prompted the programme that led to the Moon landing. It was politics. In the 1960s, the tension between the US and the Soviet Union implied an atmosphere in which winning the space race would be the ultimate form of propaganda. Ironically, the stability of the unstable relations during the Cold War provided the perfect circumstances for a successful space programme. These circumstances are currently lacking. The globalisation of our society has simplified many things, but making policy has possibly become more complicated. Successive governments have different priorities, often influenced by the world economy, treaties with foreign countries, but also by public relations and the aim to please the electorate. A project as unpredictable as a mission to Mars is doomed to be cancelled before it is even halfway completed. NASA recently announced plans for the construction of a new spacecraft to replace the now-retired Space Shuttle, which should be able to lift unprecedented weight loads into space. The presentation of the project included an unambiguous time line: the first test flight in 2017, the first manned flight in 2021, manned missions to nearby asteroids in 2025, and a manned mission to Mars in 2030. It sounds spectacular, but is it actually going to happen? An improvement with respect to previous attempts is that the project is an integral part of Barack Obama�s plan to create new jobs and stimulate the economy of the US, suggesting an optimal synchronisation with the political agenda. However, this may also be its weakness. With the presidential elections coming up in 2012, the question is whether a possible successor would share the current government�s views. Inevitably, a change of office would cause another debate on the use and danger of manned space travel, especially in view of the current crisis on the financial markets. It seems that NASA missed an excellent opportunity to involve the rest of the world and thereby ensure the longevity of their extraterrestrial ambitions. On the short term, the current proposal may look promising, but in the long run NASA�s public relations surely would have been better served by leading a joint mission of all of humanity versus the universe. It suggests that NASA actually believe a mission to Mars can be pulled off by a single country. And while the prospect of having people land on Mars is definitely exciting, the odds are against them. Astronauts haven�t been brought any closer to Mars than they were in the late 1960s. Like then, the aim is still to go to Mars in some twenty years from now. I�m looking forward to being surprised, but I wouldn�t hold my breath just yet. In the famous Star Wars movies, Luke Skywalker was born on the planet Tatooine. The remarkable thing about this dessert-planet was that it circled around two stars, i.e. it had two Suns. Ever since the run on exoplanets, planets orbiting a star other than our Sun, had commenced astronomers speculated about discovering such a Tatooine-like planet. A recent discovery shows that science fiction has indeed become reality. Using NASA's Kepler space telescope astronomers discovered a binary star system, a system with two stars orbiting around each other. Kepler is designed to measure the brightness of stars extremely accurately. This way, Kepler was able to determine brightness dips while looking at the system. Two major dips were discovered, one where the smaller star moves in front of the larger, brighter star and thereby blocks some if its light and one where the larger star completely blocks the smaller star. This is exactly what astronomers would expect in a binary system. However, Kepler's extreme accuracy lead to the detection of a third and fourth eclipse, much smaller than the other two. These eclipses recurred after varying intervals of time. Also, the amount of light that got blocked differed between the eclipses, which indicates the the stars were in different positions to the eclipsing object for each eclipse. These results showed that the eclipses had to be caused by something circling both stars and not just one of the two. Astronomers performed a series of measurements on the variations in the timing of the four eclipses. This lead to a model of the three bodies, which showed that the third body indeed is a planet. The planet is a gas-rich planet and has a mass probably comparable to that of Saturn. Although it orbits its stars at a distance comparable to that between the Sun and Venus, its temperature stays below zero. This is because both stars are smaller than the Sun and also less hot. According to the astronomers this is a stunning discovery. And probably not just for them but also for all the Star Wars fans around the world, since this shows that science fiction can indeed become reality. When astronomers look in our 'local' galactic neighborhood -only a billion light-years away or so- it seems that star formation is only vigorously taking place in galaxies that are colliding or have just collided. From such observations astronomers assumed that this must have been the case throughout the whole history of the universe. However, now it appears as if they were wrong. The European Space Agency (ESA)'s Herschel Telescope has revealed that in the early universe another mechanism was responsible for triggering high star formation rates. In order to come to this conclusion Herschel studied two patches of the sky at the size of about the third of a full Moon. Looking at such a patch not only shows galaxies that are close by but also galaxies formed in the very early universe. Herschel observed galaxies up to a distance of about 11 billion light-years away, i.e. galaxies from when the universe was only 20% of its current age. Herschel has the capability to study light in a very broad range. This broad spectrum can be used to get a more complete picture of star formation throughout the history of the universe than ever before. It was already known that about 10 billion years ago star formation peaked and as mentioned earlier, astronomers have long thought this was due to collisions at that time. However, Herschel showed that most of the galaxies at that time were not colliding or the result of a collision. They were just quietly forming stars. The light of these galaxies revealed that it is the amount of gas in a galaxy that determines its star formation rate. Actually, this is not so surprising since gas is the raw building material for stars. Shortly after the Big Bang the universe was filled with gas-rich galaxies and it now seems that it is this gas that lead to a high star formation rate. The reason why astronomers thought that collisions were responsible for vigorous star formation is probably because today's galaxies have used almost all their gas to form stars. This means that an external source e.g. 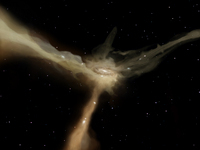 a collision is needed to trigger star formation. It seems that these Herschel observations have changed the current picture of star formation and galaxy evolution across time. Only 16 years ago, Michel Mayor discovered the first planet orbiting a star other than our Sun. Now, the amount of observed exoplanets seems to be ever increasing. One of the telescopes responsible for this increase is the European Southern Observatory's (ESO) High Accuracy Radial velocity Planet Searcher (HARPS) telescope. HARPS observed over 150 new planets and recently a there was an announcement of another 50 new exoplanets including 16 super-Earths -planets less than 10 times the mass of the Earth. This was the largest number of observed exoplanets announced at one time. So far HARPS has studied 376 Sun-like stars in our vicinity. This enormous amount of information gave astronomers a chance to estimate the likelihood for a star to have a planet smaller than Saturn. It turns out that about 40% of the stars similar to the Sun are believed to host such a planet. It is believed that the amount of Earth-size planets is even larger. Also, the majority of planets with a mass of Neptune or less appear to be in a multiple planet system. HARPS discovers planets by studying small wiggles in the position of the star. Due to (a very small) gravitational pull of a planet on its host star, the star moves a bit in the direction of the planet. Since the planet orbits around the star, this makes the star move in an extremely small orbit as well. HARPS is capable of measuring extremely small differences in the motion of a star and can thereby imply the presence of a planet. Smaller planets are much easier discovered around stars that are closer by. Therefore, HARPS focused on 10 Sun-like stars that are very close. It turned out these stars host 5 not-yet observed planets with masses less than 5 times that of the Earth. One of these planets is only 3.6 times the mass of the Earth. Also, this planet is believed to be at the edge of the so-called habitable zone. The zone around a star, where the circumstances are suitable to form life. Astronomers are constantly trying to push HARPS to its limits. Recent tweaks have made it possible to observe planets of only two times the mass of the Earth. Also, a copy of HARPS will be installed on the Telescopio Nazionale Galileo in the Canary Islands, to look for stars in the Northern Hemisphere (HARPS is located in Chile in the Southern Hemisphere). Probably only a few more years before astronomers will find the first Earth-twin. One of the biggest explosions known in the universe is a supernova explosion. Often supernova explosions mark the end of a massive (over ten times the mass of the Sun) star's life. However, in one case, the so-called type Ia supernovae, the formation process is not quite understood. This is very unfortunate, since type Ia supernova are very important in measuring distances in the universe. Recently, a new suggestion was made, stating that it is a ticking time bomb that could cause the explosion. What is known about a type Ia supernova is that it is caused by the disruption of a white dwarf. A white dwarf is the remains of star with an initial mass of maximum 8 times that of the Sun. In its final stages, such a star ejects its outer layers, leaving nothing but a dense, small (Earth-sized) core, which is then known as a white dwarf. Such a white dwarf can weigh up to 1.4 times the mass of the Sun before it will collapse under its own weight. When this collapse occurs, a runaway nuclear fusion process starts up leading to a type Ia supernova. What is not known about the type Ia supernova is how a white dwarf, which is initially about as massive as the Sun, gains its mass to explode as a supernova. There are some suggestions that it gains mass from a companion star and there are some that think it is the collision of two white dwarfs. The first scenario is favored by most astronomers, but so far signs of this theory have not yet been found. You would expect to find some fingerprints of matter that had not yet been accreted or a companion star in the vicinity of the explosion. Recently, a new mechanism has been proposed that could explain why none of the signs of the accretion theory have been found. When a white dwarf accretes mass from a companion it also starts to spin up. When it rotates fast enough, it can support more weight than just 1.4 times the mass of the Sun. When the accretion process stops, the white dwarf very slowly slows down. However, this process can take billions of years, leaving enough time to get rid of the none-accreted material. Also, the companion star has enough time to end its life as a white dwarf, which makes it much harder for astronomers to spot. Eventually, the 'too massive' white dwarf slowed down enough to ignite the fusion and explode as a supernova. So far, no signs have been found to support this theory, but that could be because astronomers were looking for the wrong things. With better telescopes that are coming up in the near future the astronomers are hoping to observe white dwarfs around the place of the supernova, confirming the ticking time bomb idea. An astronomical theory can never be kept as always true, since there may always be a case in which the theory proves wrong. A new observation can confirm the theory but it can never prove that there might be another not yet observed phenomena that disagrees with theory. If a disagreeing observation occurs, the theory has to be discarded or at least rewritten to explain the new phenomena. This latter is what should happen to the theory of star formation after the discovery of a star that should not exist according to that theory. 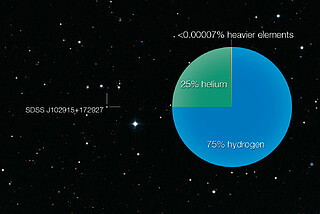 Astronomers discovered a star with very few other elements than hydrogen and helium. These two elements are the elements that were created shortly after the Big Bang. All other elements were created later by stars that consisted of only hydrogen and helium. These stars were believed to be very massive. When such massive stars die, they produce an enormous explosion, a so-called supernova. These explosions are so energetic that they lead to the formation of almost every other kind of element in the universe. Therefore, the sooner a star got formed after the Big Bang, the less metals other than hydrogen and helium it contains, since there have not been a large number of supernova explosions yet to produce other elements. The leading theory of star formation explains why these first stars had to be so massive. Stars form from collapsing gas clouds. The bigger a cloud, the bigger a star it forms. During this collapse, lots of heat and pressure are generated. Without any other elements than hydrogen and helium in a cloud, a small cloud would not be massive enough to suppress this heat and pressure and the collapse would seize. Elements other than hydrogen and helium have as a characteristic that they tend to cool the gas. Due to this cooling the amount of heat generated is lower, and the cloud can continue to collapse. Therefore, when there was a lack of these other elements, no small stars could form. The peculiarity about the recent discovered star is that although it contains almost only hydrogen and helium, it is less massive than the Sun. Its composition tells astronomers that it should be formed very shortly after the Big Bang, while its mass tells them that it must have formed much later. At this point the theory of star formation is apparently not (yet) capable of answering this question. Also, astronomers have a few more candidate impossible stars, so it is really time for a small revision in the theory of star formation. Like many other galaxies, also our Milky Way is currently forming new stars. However, at the rate that this is taking place, the Milky Way would ran out of fuel in a very short time. There has to be some fuel reservoir, not yet observed, that is being used to keep the Milky Way's star formation rate at its current pace. Recently, astronomers have discovered this reservoir in the outskirts of the Milky Way. Some time ago, computer models already suggested that there should be gas clouds around the Milky Way, but no one had been able to observe them yet. Large, fast-moving clouds have been seen covering the sky before, but no distance could be measured, so there was a chance these clouds had an extra-galactic origin. Using the Hubble Cosmic Origin Spectograph (COS), which got mounted onto the telescope during its final service missions, astronomers were able to get distances to these clouds. Distances to clouds can be measured by studying the light of objects behind the cloud. When light passes through the cloud, the cloud leaves some sort of fingerprint in the spectrum of the light. Studying the light's spectrum could then tell you more about the substances of the cloud and its distance. Previous attempts focused on distant quasars as light sources shining through the clouds. These are distant galaxies that are emitting bright lights from their supermassive central black hole while it is eating stars. Unfortunately, this light was too faint in order to estimate the distance to the clouds. The COS focused not on quasars but on stars around the Milky Way of which the distances were known. The light of these stars was bright enough for the astronomers to determine that these clouds are actually residing in the outskirts of the Milky Way. Not only does this discovery explain where the Milky Way's fuel is coming from, also more details about the models got confirmed. 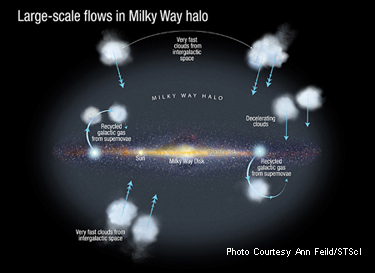 The models predicted that the gas clouds slowed down as they approached the Milky Way, which was also seen in the observations. Now the astronomers know where the Milky Way's fuel is found, they just have to figure out how it got there.